Select "Print in black and white"
When printing same file multiple times, select/check "Keep duplicate documents"
From the Apple menus, navigate to either of the following: System Preferences > Print & Scan or System Preferences > Print & Fax. Click on the [+] sign and then the Default Tab. On the Default tab, select (highlight) the printer from the list of discovered printers. 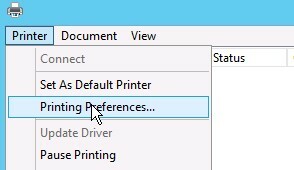 Option: For printers that do not support Bonjour, select IP tab, select HP JetDirect Socket under the Protocol tab, and then enter the printer IP Address. The system will automatically search for the applicable driver. Note: If the printer driver is not found, select it manually from the Print Using drop-down list. Click Others and search for your printer model's corresponding PPD file. Click Add. A print queue will now be created under system preferences. To verify this: Go to System Preferences > Print and Scan or System Preferences > Print and Fax. Creation of a graphic with a company logo for use as an overlay. 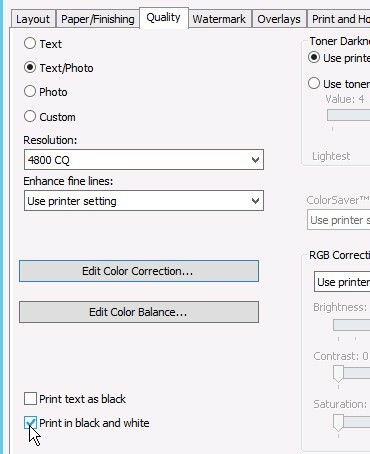 Printing the logo as a print file (.prn) by temporary changing the "printer port" setting to "Print to File". PCL XL is the preferred emulation in most cases.